Here is my card, featuring the new Hazel Witch stamp, Bare Branch, and Halloween is a Hoot. Also featured is the new Onyx black 8.5×11 paper, which I used to make a card measuring 5.5×4.25 . I still have a few spaces left in each of my classes at The Paperie on Monday and Wednesday, and I’ll also be hosting make’n’takes today, Tuesday, and Thursday – bring the kids or a friend, or just take some time for yourself to stamp and get crafty. Stay tuned throughout the week for even more inspiration, and I’m doing double-duty this week by posting different cards for the Amuse-Bouche on The Paperie Blog too, so pop over to have a peek! 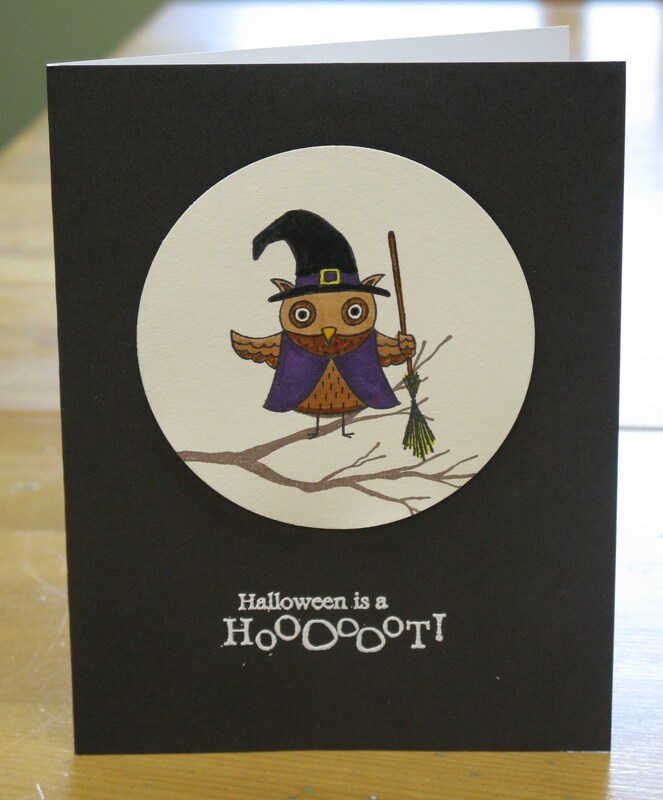 Love how you coloured the owl – fabulous card. So glad you could join us for this round of amuse-bouche! Soooo cute! Love the white sentiment! Congrats on your 1st amuse-bouche! It’s fabulous…loving the colors of the owl!